✮ Use Numerology to Empower Yourself With A Clearer Understanding of Your Love Life, Career, Hidden Potential, and Much More. ✮ Gain Clarity And Certainty – Resolve Inner Conflict – Discover Your Strengths And Avoid Missing Out On Future Opportunities. ✮ 60+ Page, In-Depth Written Report Including 12 Month Day-By-Day Forecast, Personal Calculations & Detailed Analysis. ✮ All Calculations And Reports Are Calculated With Accuracy Using Each Individuals Birth Data. ✮ A Unique And Thought Filled Gift Idea For A Loved One, Or Why Not As A Gift To Yourself. ✮ Created By Our Professional Numerologists & Delivered Directly To Your Email Within 72 Hours Of Ordering. I bought for myself and it was just what I needed! It was delivered on time and loved reading it. I ordered my report on Wednesday and had it by Saturday. Loved how it written, made for easy reading. I liked the report but think 2 days is a long time to wait. Hi Guys, thanks again for getting it to me a day earlier, wonderful service. She was delighted with her report in the end! Numerology is a fast and precise way to identify life patterns, learn what makes us unique and discover how we can better interact with others. Numbers reveal the universal factors that influence the days, weeks, months and years of our lives. In Numerology, each number is seen as having its own unique personality. Its significance and meaning vary with the environment and location. Numerology studies and identifies the significant numbers in your life. These numbers can be examined in a numerology chart, revealing a great deal about character, purpose, motivations, talents, direction, and clarity. By analyzing things such as your date of birth, current name and birth name, a Numerology chart can be calculated and interpreted into a detailed and personalized numerology report. This unique numerology chart forms the backbone of your report, it summarises the key numbers in your life, such as your life path, hidden passions, heart’s desire and more. The numerology report which seeks to interpret how this information relates to your life patterns and transits. Trends can then be identified and personalized for the coming year. A forecast can then be calculated. Along with the option of assessing numerology compatibility. All of this information is then formatted into a personalized numerology chart reading and report. This 60+ page written PDF analysis discusses areas such as personality, love, life, career and the trends affecting your life. Finishing with a 12-month in-depth day by day numerology forecast. What’s the difference between the numerology chart reading and astrology birth chart? 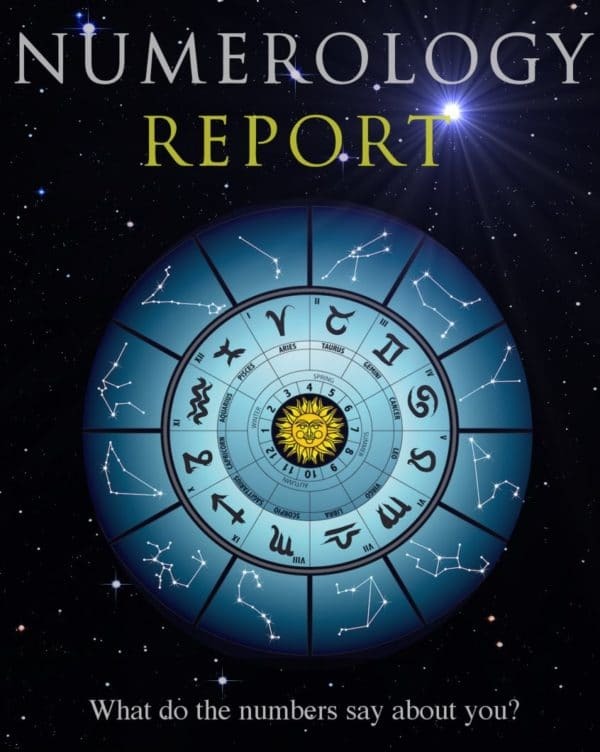 The Numerology chart report uses significant numbers that are extracted from details such as name, date of birth, etc, to make calculations that reveal aspects of personality, relationships and factors influencing your life. In contrast, the Astrology Birth chart is based on astrologic techniques. Using calculations that focus on the relationship and alignment of the planets and our place within the houses of the zodiac. Unlike the Birth Chart & the Zodiac Compatibility Chart, the Numerology chart uses calculations based primarily on important numbers in your life. AstroGifts "The Gift Of A Lifetime"